For people in the know, raw kombucha is all the rage in the USA. 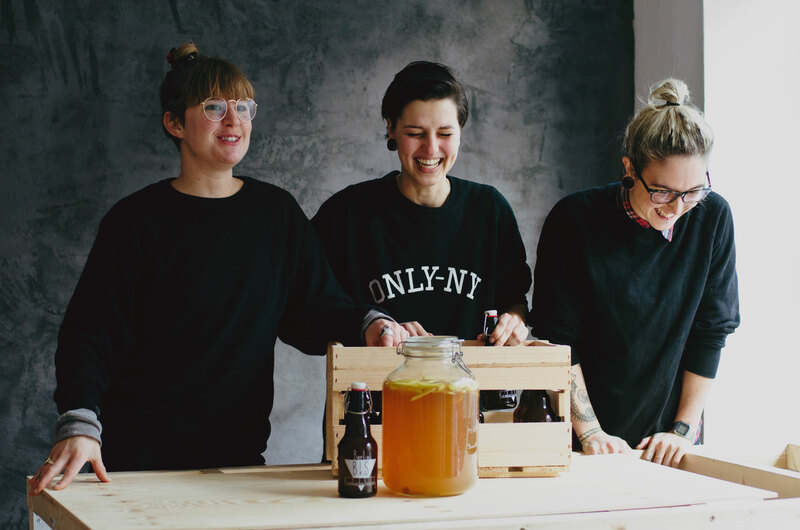 The fizzy fermented drink is gaining a following in Europe, and Lucy Darke, Audie Hillock and Linn Freyer founded the Berlin Kombucha Society (or BKS for short) to answer the growing demand in Berlin. Foodadit first discovered the BKS at Berlin Food Week, where the founders were talking to everyone about the benefits of raw kombucha. I met them at their new deli (Alt-Treptow, Berlin) to find out how they are bringing it to the people of Berlin. 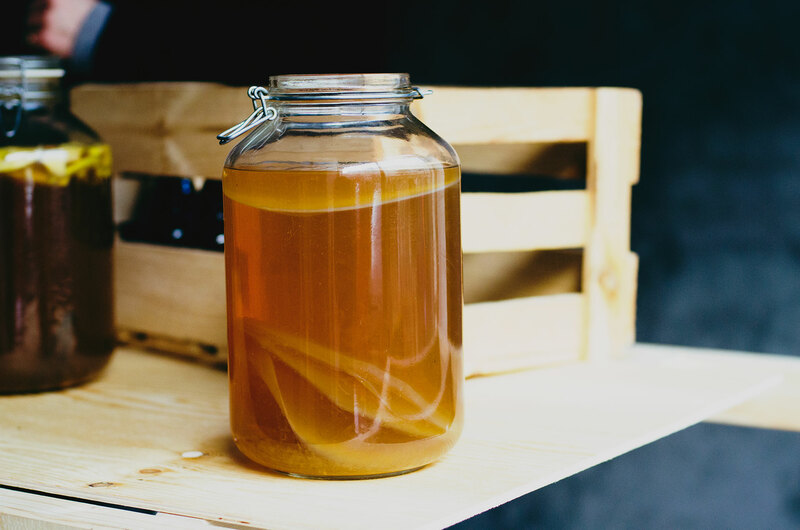 If you’ve never heard of Kombucha, or never dared ask what it is, it’s a kind of fermented tea, produced with a SCOBY (symbiotic colony of bacteria and yeast). The result is a drink that is fizzy, sour and has a taste like no other. It is said to help maintain a healthy balance in your stomach, and boost your immune system. It is not completely sugar free, but the sugar content in it is considered to be pre-digested, making it much easier for your body to process. You can buy it in health stores, but this is almost always pasteurised and usually incredibly sweet. “I think we are the only producers of pre-bottled, raw kombucha in Berlin,” explains Lucy. Leaving the kombucha unpasteurised means that you still get the health benefits from the bacteria present from the fermentation. Lucy learnt how to make kombucha when she was living on a farm in California – “I became addicted to it and when I came back to Berlin, I started making it.” And together with Audie and Linn, they founded the Berlin Kombucha Society. They’ve now been selling kombucha for about 6 months in a few locations across Berlin and in the first week of January 2016 they opened their own café and deli, where they’ll sell their kombucha and other nutritious products such as, freshly pressed nut oils, sauerkraut and nut cheeses. All three of them are devout coffee drinkers, so it’s also a given that they will have the best coffee on offer. 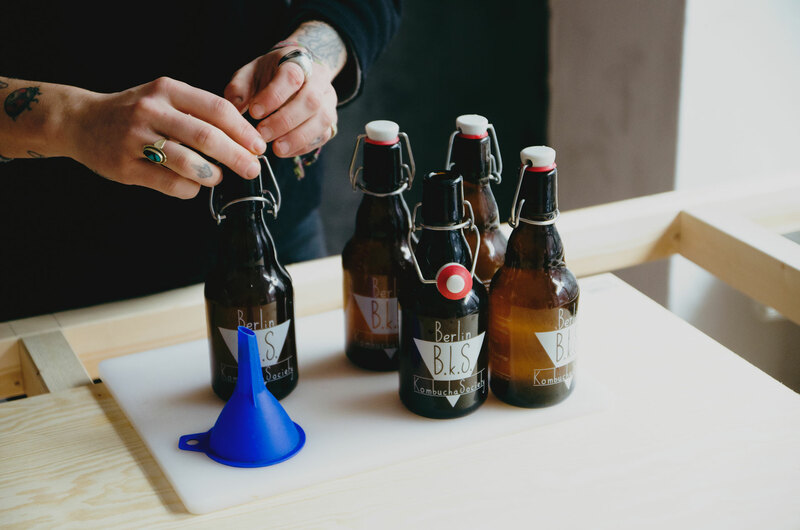 The owners of the Berlin Kombucha Society are hoping to build a community of people who care about what they eat and drink. Audie points out, we don’t just want people to come and get nice things from us, we want to help people make better food themselves and their families too, by creating a place where people feel welcome to ask questions and learn. We don’t just want people to come and get nice things from us, we want to help people make better food themselves and their families too, by creating a place where people feel welcome to ask questions and learn. If you’re feeling adventurous, try making your own kombucha with the Simple Kombucha Recipe and the Apple and Cinnamon Spiced Kombucha recipes below from the Berlin Kombucha Society. Have fun in the kitchen, don't be afraid to adapt and play with recipes.